Ross County assistant manager Steve Ferguson insists he has "not given a thought" to the prospect of succeeding the sacked Derek Adams. Ferguson and captain Richie Brittain took the team for Saturday's 4-0 defeat by Hamilton Academical. And Ferguson, 37, also indicated it was too early to say whether he would be interested in assisting Patrick Kluivert, who has applied for the job. "I don't know, we'll see what happens," Ferguson told BBC Scotland. "I was asked to take the team for three days, which I've done. The players have given me that much respect, which I appreciate. "There's names banded about all the time at any football club. The previous manager had so much success. It'll be a hard act to follow, whoever takes this job on." 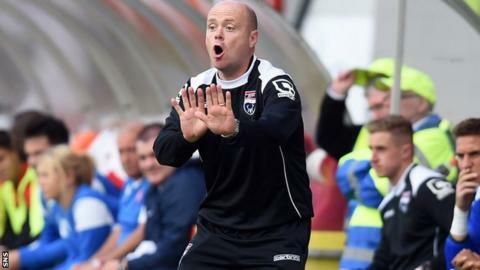 Adams left County on Thursday after leading the Dingwall side to promotion and keeping them in the Scottish Premiership two years running. Victoria Park chairman Roy MacGregor confirmed former Netherlands striker Kluivert had put his name forward. And, when asked whether he would like to keep working at the club should the Dutchman be appointed, Ferguson replied wryly: "Under Patrick Kluivert? I think he'd be delighted to have Stevie Ferguson working for him." Hamilton won and converted two penalties as they romped to victory against a struggling County side, who missed a spot-kick of their own when Brittain's effort was saved. The result leaves the Highlanders bottom of the Premiership on goal difference, without no points from five matches. "It's been a difficult week for the club and I think the week's taken its toll on everybody," added Ferguson. "It's been tough. "We were beaten by a good Hamilton side, no complaints there. We were well turned over."